Throughout man's history he has looked at the stars to wonder what was out there, and just how good the cheese that the moon was made of would taste. In the realms of science fiction, man has come face to face with what's out there. Sometimes it's funny, and sometimes friendly. And sometimes, it is downright nasty! That nasty side of things has been the running theme for the series of Alien films. This series of films is the basis for a line of high quality resin busts and statues from Palisades Toys. 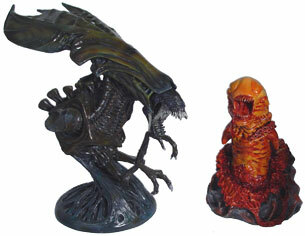 The first releases for the series were an Alien mini-bust and a statue showing an alien dramatically posed as if in a fight. The payoff for the statue is that it links with a statue of a Predator (another venerable sci-fi property) to make a larger diorama. (Note: The Predator statue will be the subject of an upcoming RTMisc.) 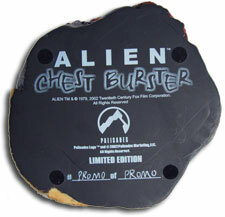 The Chest Burster statue and Alien Queen mini-bust are covered here, and they will be followed by a statue of the Space Jockey in April 2003, an egg statue in June, an Alien Warrior mini-bust in August and the missing step of the alien's life cycle in a life-size face hugger (face included) for November. The alien creature itself was designed by the Swiss artist HR Giger after a copy the artist's 'Necromicon' was given to Ridley Scott as a gift. Giger not only created the look of the alien, but he also worked on some of the sets and even contributed some sculpting for the movie. His involvement with the movies was mainly limited to the first one, though he did pass along some ideas for Alien 3 that were largely unused. The two sculptures sort of capture a cradle to grave image of an Alien. On the one hand you have the baby in the chest burster, struggling to enter the world and survive. At the other is the Alien Queen, she who the others serve and who lays the eggs to make sure they persist. The cycle of life works for the lion king and alien queen. What a wonderful world! 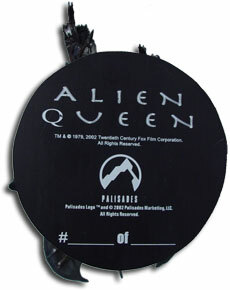 The original, singular Alien introduced moviegoers to the darker side of space. The introductory chapter only had one alien, but that was enough to kill off the crew of the mining ship Nostromo in quite ruthless fashion. The movie is first and foremost a tale of horror, and Ridley Scott's work still holds up well today even after twenty years. The now Sir Ridley has moved on to other things (like Gladiator and Black Hawk Down), and so has much of the cast. Sigourney Weaver is the one most people remember, but there's also a pre-Top Gun Tom Skerrit, Veronica Cartwright before she hooked up with the cigarette smoking man on the X-Files, Yaphet Kotto coming off his villainous role opposite James Bond in Live and Let Die, and Ian Holm (Lord of the Rings Bilbo Baggins) as the artificial Ash. However, of the memorable moments from the film there is still one that sticks out - dinner with John Hurt. Saying the man leaves a mess doesn't begin to describe it. After a run-in with the facehugger the crew found in the alien ship, Hurt's Kane character should have put a 'baby on board' sign in his suit, because from then on he was playing host to a baby alien. Since men aren't truly equipped to give birth, and this was one baby that was coming out one way or another, the 'do-it-yourself c-section' was born. Unfortunately, mommy didn't make it and his shining pride and joy ran off to hide and get very big very quickly. An interesting note about that scene is that it was played out nearly identically in Mel Brooks' Spaceballs with John Hurt reprising his chest-bursting role with a singing and dancing burster. The Palisades Toys version of the chest burster doesn't sing or dance, but if you eat it you will find it can burst from another area. However, the surgeon general (and any sane person) has determined that trying to eat it (much less completing the job) is a very bad idea. The best use for this statue is for display, and it makes a great centerpiece for the dinner table. The creature is captured in all his gory glory looking as if he just burst from the chest of an Englishman ready to join the United States in the 'I beat England' club. The little fellow has a bit of bloody gore stuck on his chin and his flipper arms, and he's wrapped in the torn shirt of his victim. The tail of the creature wraps around the base and you can see bits poking through the gore here and there. The burster is washed in shades of red along his body, with a slight glimpse of blue veins underneath. He's nearly seven inches of slimy creature who can't wait to grow bigger and eat you. With a subject as unusual as the bloody burster you'd want to get a sculpting house that specialized in the unusual. That house would be SOTA Sculpture and Design, whose other work for Palisades has included the Alien and Predator busts and statues from Palisades, and the Adult Super Stars action figures. SOTA is also the license holder for the next Lara Croft movie, so look for those figures when the movie hits. SOTA did the sculpting, paint and prototyping for the Burster, and he's packed in a snazzy box with an open window so you can view the bust before opening it. You can thank Keith Wilson for that gem, so go thank him! Making any sequel means that you'll be compared to the original, even if you weren't even involved. And that comparison might not be kind if you just make a re-hash, so what do you do? If you're James Cameron, fresh from the success of The Terminator, you either make a movie about a sinking ship or go about 180 degrees off from the original. The sinking ship would have to wait a few years and he went for the opposite treatment. Alien was a horror movie at the core, and the plural Aliens is an action movie. 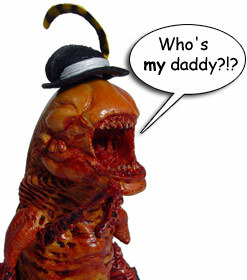 What you have are the things you loved to hate about the first movie - the icky alien - yet in bigger numbers. Since there are more of them, to keep things even you need to bring more guys. When you need a few good men, you go to the Marines (Colonial Space Marines that is) with their semper fi, do or die attitude. This time, most of them die, but the audience gets to enjoy it. The aliens in the second movie are certainly mean, but they say behind every plot to rule the universe is a woman, and the Alien Queen is it. Strong women are a trademark of James Cameron's films, and this time he has the meanest alien woman against the toughest human woman he can find in Sigourney Weaver. The result - cat fight!! And women fight dirty! The Alien Queen runs the hive and directs all her drone workers in building a nest, gathering food and killing of their enemies. She is also the egg machine, running 24/7 pumping out future servants for the species. Being barefoot and pregnant all the time makes her irritable, and that look is captured in this mini-bust to a 't'. Mini-bust is the right term, but there isn't anything mini about this piece. The bust itself is much larger than the chest burster at nine inches tall. Being the queen of an alien empire will give you a big head, and she has one. The head is over ten inches long and six inches wide, and an apartment as big as this head would rent for over $500 a month in New York City. The piece is pretty heavy, so make sure it's on a sturdy shelf. The sculpture is kind of a half-torso bust and the base is a maze of chitinous materials built like an alien hive. The base is a subtle mix of blues and greens and it rises into the brownish, insect-like queen figure complete with a pair of small arms. The double mouth is well represented in the figure, and there are some transparent strands of spittle around the mouth. Someone get this woman a napkin! SOTA was enlisted for the Queen Alien mini-bust's sculpting, paint and prototyping. Greg Leeuwen designed the packaging for the queen, and she also has a window in the front so you can check her out while safely behind the plastic. Where to buy the Aliens: The Alien Queen bust retails in the $49.99 USD price range and the Alien Chest Burster statue retails in the $31.99 to $39.99 USD price range. They are available at trend and specialty stores, such as Tower Records , as well as various online toy and collectible retailers.